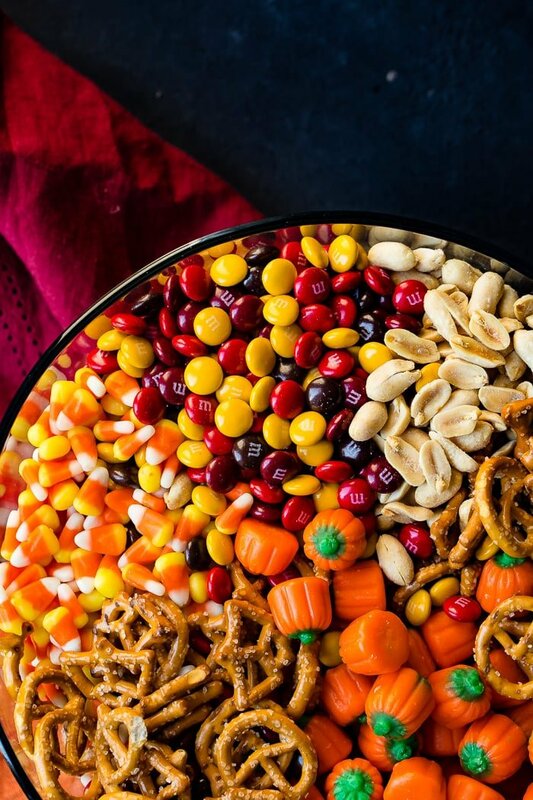 It’s almost here and I have no idea what to do about Halloween costumes, but I do know that this 5 Minute Halloween Snack Mix is totally happening! I’m totally and completely drawing a blank for ideas this year. Cade is totally not up for this whole dressing up thing this year. Which is fine, 9/10 men aren’t, don’t you think? Last year we were Maverick and Charlie from Top Gun and I thought that it was so cute and fun until we started walking around the block with our kids to Trick or Treat. Don’t worry, everyone thought that I was our darling neighbor, which is fine, she’s beautiful but totally not the blonde I was going for. Haha! Now that I think about it, maybe I should have Cade and I actually dress up as them this year!!! 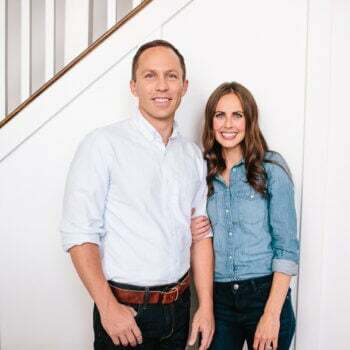 We’ve tossed around the idea of being Chip and Joanna Gaines, the Beckhams, maybe Britney Spears and Justin Timberlake when they matched in all denim? You can see why Cade isn’t super interested. I need to keep thinking. In the meantime, do you dress up for halloween or is that just a kid thing? Every time there’s a Halloween party or even worse, a school Halloween party I stress over what to take. You see, I don’t do cute, and Cade DEFINITELY doesn’t do cute, but pinterest makes you feel like you totally have to. 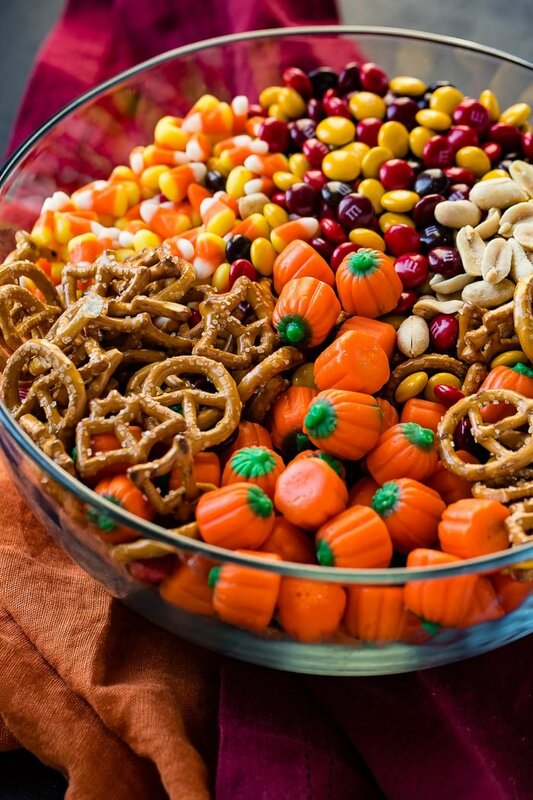 So what’s a good Halloween snack for a party that doesn’t have to be all cute and decorated? 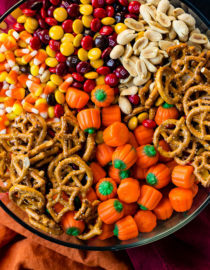 5 Minute Halloween Snack Mix! Guess what, your guests and the kids at school will like it way better than a jello mold brain with fake blood. I mean, that is pretty cool actually, but listen, this will taste better and only take 5 minutes!! 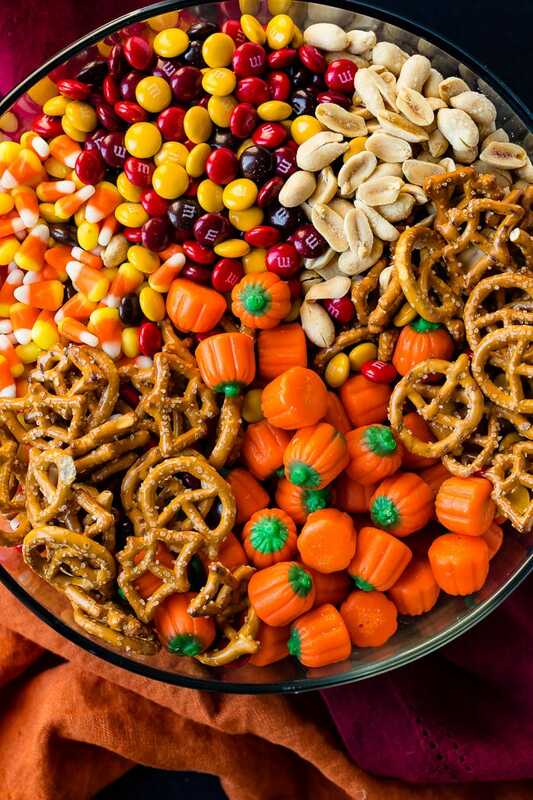 Halloween snack mixes can have anything you like in them. Our Reese’s Snack Mix is a great option if you aren’t into the candy corn thing, but the kids really go crazy for this one. 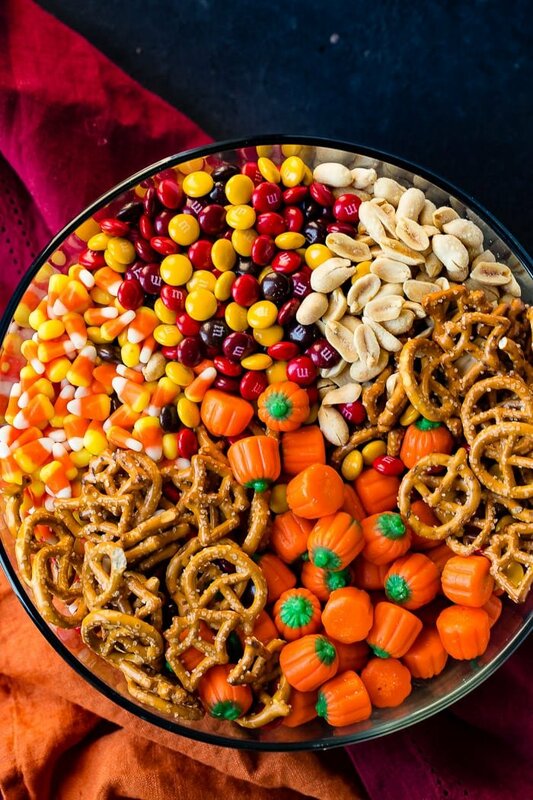 Looking for different options for your Halloween Snack Mix? Try some of these! 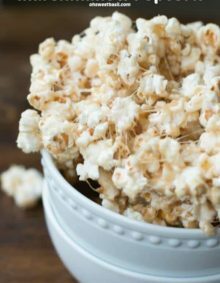 Halloween Snack for the classroom ideas don’t have to be a huge hassle either. 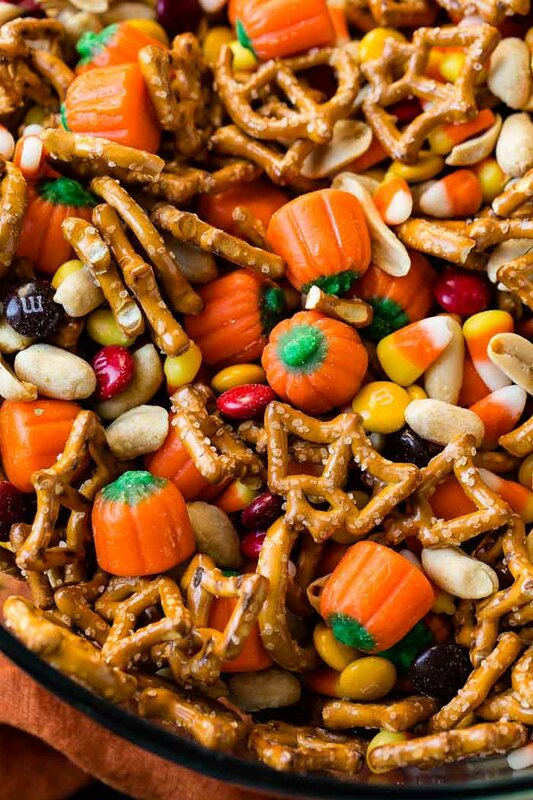 So even if you don’t make our 5 minute Halloween Snack Mix you could totally make one of these great ideas. Graveyard Cups- Fill clear cups with chocolate pudding and cookie crumbs and stick gummy worms in the cup. Stand up a mint milano cookie as the tombstone. 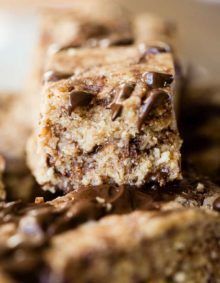 Mummy Nutterbutters- Drizzle white chocolate over nutter butters and place two mini chocolate chips for the eyes. 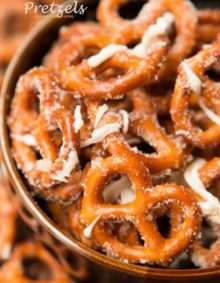 Looking for more Halloween Snack Ideas Recipes? 5 Min Reese’s Snack Mix, Casper’s Cocoa Mix, Mummy Pie Pops, Zombie Dip! Place all ingredients in a large bowl and toss to combine. Store leftovers in a freezer bag or Tupperware in the pantry. I’m always running behind on school party days. I love how quick and easy this idea is to put together – and how versatile it is! Thank you Kristen!! And yes, this mix is so perfect for any holiday or any party! 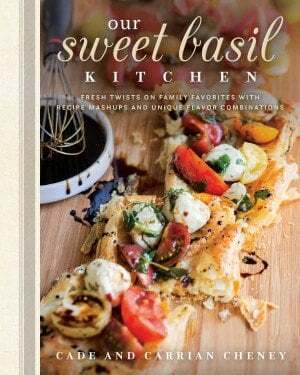 Such a fun treat – this is great for parties when you need something out for a lot of people! Disappears quickly! You nailed it! And it takes pretty much zero prep time! Winning! I like the “no cook” mixes. Right?! It makes it so easy and everyone loves it!